CCCHST is one of twenty model worker training programs recognized and funded by the National Institute of Environmental Health Sciences (NIEHS). The reauthorization of the Superfund program in 1986 directed OSHA to develop worker protection regulations for handling hazardous waste. This resulted in what is commonly referred to as the HAZWOPER regulation, covering Hazardous Waste Operations and Emergency Response. The reauthorization also directed NIEHS to develop model worker training programs. CCCHST is the only community college consortium sponsored by NIEHS. 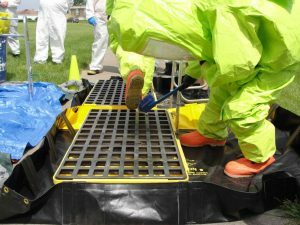 Congress intended these programs prepare a highly trained workforce capable of safely handling the cleanup of hazardous waste sites and other incidents in which hazardous materials are involved. Members are required to return every other year for an Instructor Refresher training offered at colleges across the nation. Members use HMTRI curriculum to train workers and responders in their local area. Twenty-four hours of the HazWOPER course is also available online to members at no cost. Members report to PETE the number of courses they provide to their communities, if significant they are provided a small reimbursement for the effort. PETE reports these numbers to NIEHS. CCCHST members may charge for the courses offered in their local area. Members must report numbers to CCCHST to remain in the organization.